The elegant Swiss ski resorts of St Moritz, Verbier and Klosters dominate many winter holiday brochures - but little Andermatt plans to rival them in future. One of the Middle East's biggest hotel groups is on course to transform Andermatt into a luxury resort, complete with a golf course and a pool with its own sandy beach. 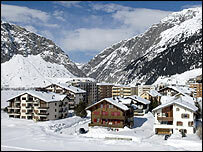 Andermatt, in southern Switzerland, has traditionally made its money from the Swiss army. This was where Switzerland's elite alpine regiments trained, practising mountain warfare against an invasion which of course never came. Andermatt's barracks used to house up to 1,000 troops, and the army was the biggest contributor to the local economy. But the end of the Cold War brought big cutbacks in Switzerland's defence budget, and today only a handful of recruits ever spends time in Andermatt. Jobs have become hard to find, and many younger people are leaving the area. But now the village may have found a solution. Samih Sawiris, the billionaire owner of Egypt's Orascom hotel chain, has bought up the land vacated by the army, and has announced plans to build five top-class hotels, and several hundred luxury villas and apartments. The resort will also boast an 18-hole golf course and a tropical spa and swimming pool facility. Andermatt's residents were at first somewhat bemused by the scale of the plans; the resort will double the size of their village. The new hotels are expected to bring an extra 2,000 jobs to Andermatt, while the population of the village at the moment is only 1,600. And many wondered whether some of the more ambitious proposals, in particular the plan for a high-altitude golf course, were really suited to Andermatt's traditions and climate. But after numerous town hall meetings, which were addressed by Samih Sawiris in person, most people have come to see the proposal as a form of salvation. "I think we can see a secure future now," said a resident after leaving one of the meetings. 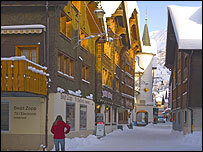 "This will stop Andermatt becoming a forgotten little alpine village." The Swiss government seems to think so too; Mr Sawiris has been given a fast track through much of the bureaucracy of buying land and gaining planning permission. The strict law prohibiting foreigners from purchasing land in Switzerland was even relaxed especially for him. But supporters of the plan reckoned without the stubbornness of local farmers. When it became clear that the golf course was going to swallow up more land than had originally been expected, farmers faced with losing some of their fields dug in their heels. For several months the project looked threatened, and Samih Sawiris hinted that he was not prepared to wait around forever. Finally two local residents sold their land, which was then offered to affected farmers in exchange for the land they would lose - and the project was back on track. A final hurdle was overcome at the end of March when the residents of Andermatt went back to the town hall - this time to vote overwhelmingly in favour of the project. Building is set to start in 2008, and Samih Sawiris cannot disguise his satisfaction. "I've been very successful in the Middle East," he said. "But in a way that's second division. Now I want to play with the big boys, and the big boys are here." All Mr Sawiris needs now is guests, but he, and the residents of Andermatt, seem confident people will flock to the new resort. The project, when it is finished, is intended to be an oasis of luxury set in some of Europe's most stunning alpine scenery. And it is situated just a couple of hours from two of Europe's most affluent big cities - Zurich and Milan. It will be a big change from the officers' mess and the recruits' iron bunk-beds. 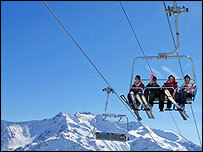 Andermatt will never be the same again.